The Motor Vehicle Administration has enormous power. This State Agency controls your ability to drive in Maryland. If you are facing a MVA hearing, you absolutely need an attorney. The law in this area is constantly changing and the consequences of MVA Hearings are severe. 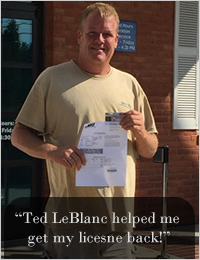 Ted LeBlanc has handled thousands of MVA hearings, including litigating and winning MVA Appeals.